Sea glass comes in so many beautiful colors. In this post I will reveal where the different colors come from and how rare they are. Who knows, you may have a few gems in your collection! By the time you find a piece of sea glass on the beach, it has been on quite a journey. Whether it was a bottle, vase or something completely different, it has been tossed about in the waves for decades before ending up in your pocket. 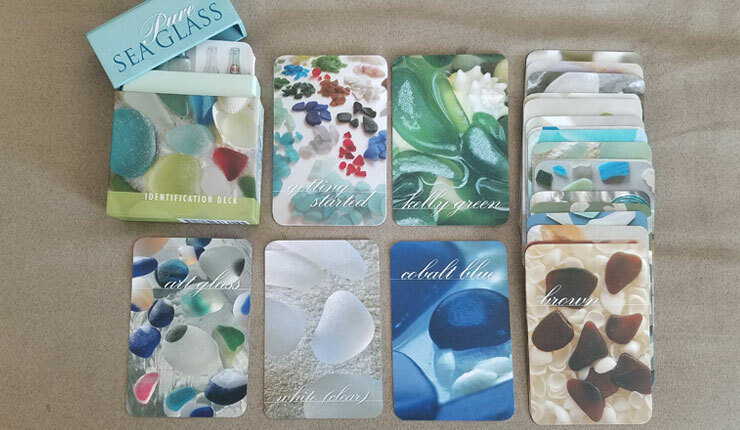 When organizing my sea glass collection, I like to refer to Richard LaMotte’s "Pure Sea Glass Identification Deck" which is a deck of 35 laminated cards. I often take them to the beach too! LaMotte categorizes colors into four groups: common, uncommon, rare, and extremely rare. 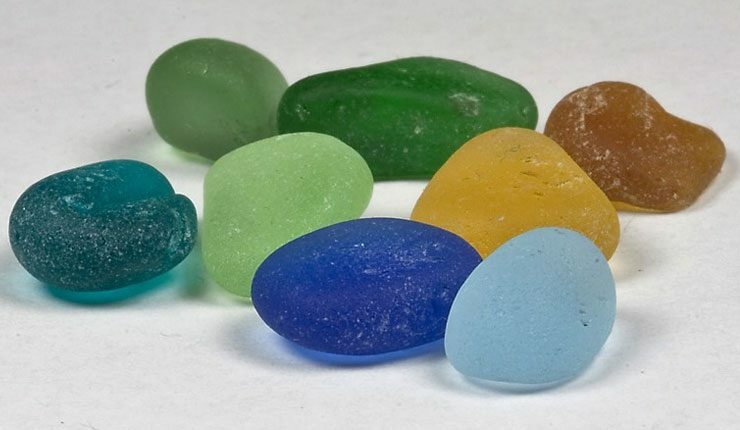 Click here to read more about the "Pure Sea Glass Identification Deck"
The most common colors of sea glass come from glass products that are still in use today; clear, brown and green. Most clear sea glass comes from items such as soda bottles, glass food containers, liquor bottles, wine bottles, Mason and Ball canning jars as well as old milk bottles and medicine bottles. Clear sea glass looks frosty and white when dry and is often referred to as white sea glass. Roughly two out of three pieces of sea glass you find will be clear or white. Brown sea glass may come mainly from beer, root beer and whiskey bottles. The older the glass the less common it is. Old Clorox and Lysol products came in large brown bottles. Today, many wine and American beer companies still use brown bottles to help protect the liquor inside the bottles from the sun. Something in the region of one in two pieces of sea glass will be brown. Kelly green sea glass is the most common green found today and comes mainly from lemon-lime flavored sodas such as 7-UP, Sprite, Mountain Dew, wine and beer bottles such as Heineken. One in five pieces of sea glass will be green. A complete bottle neck is always a great find! Seafoam green was a common color for bottles in the late 1800's and early 1900s. Green or soft aqua is the natural color of glass caused by the iron naturally found in batch sand. A common source of this color of glass may come from old Coca~Cola bottles which can be found in clear, and shades of aqua, seafoam green and light blue, other sources of seafoam green may be old seltzer mineral water bottles, baking soda, fruit jars, and ink bottles. If you find a thick soft green or seafoam shard, it’s likely from the early 1900's. One in fifty pieces of sea glass will be seafoam green. I found all of this at Seaham, England in just a few hours! Forest Green sea glass. Forest green sea glass is mostly from beer and wine bottles, some of it may also be from art glass. One in fifty pieces of sea glass will be forest green. Lime Green sea glass. Lime green sea glass is mostly from beer and lemon-lime soda bottles. 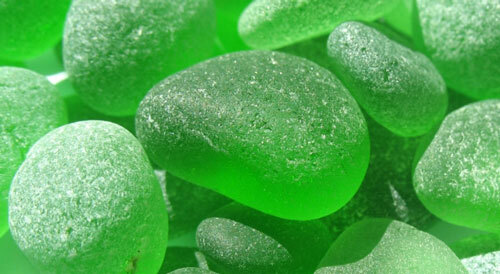 One in fifty pieces of sea glass may be lime green. You will find lots of these perfectly formed nuggets at Seaham too! 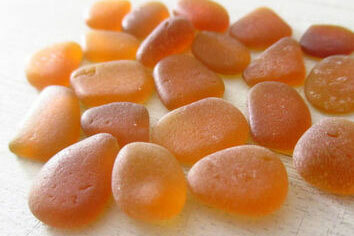 Some pieces of amber sea glass can date back to the late 1800's. Old Clorox and Lysol bottles along with tobacco snuff jars, medicinal jars, beer bottles and even brown mason jars have all contributed to the abundance of brown and amber sea glass. One in twenty five pieces of sea glass may be amber. Much of the lavender sea glass comes from older Pre World War I clear vintage canning jars and other glass containing manganese, a de-colorizer originally used to remove the green or aqua caused by the iron naturally found in batch sand. Some manganese dioxide decolorized bottles may date as early as the 1820's and as late as the 1930's. Over a period of many years the glass made with manganese turns lavender when exposed to sunlight. This is called "sun-purpled". 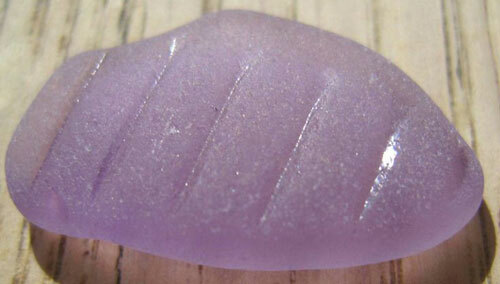 One in three hundred pieces of sea glass will have a lavender hue. You could always try laying some of your clear pieces out in the sun for several weeks to see if they turn lavender! Depending on where you are in the world, you may find less lavender sea glass. But don't stop looking! 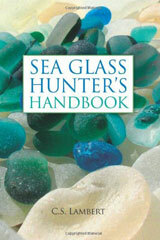 "The perfect guide for both seasoned and novice collectors, The Sea Glass Hunter's Handbook reveals how to locate the best beaches and predict optimum conditions; understand coastal access laws; determine the personal and professional value of sea glass and identify the source of individual fragments." 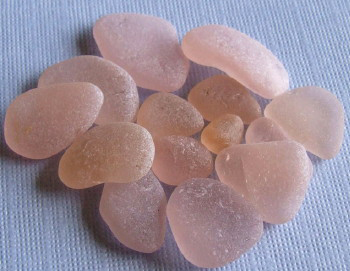 Pink sea glass is usually a soft peachy pink. Much of the pink sea glass we find today most likely comes from Depression Glass. Depression glass was produced in the US in the early 1900's and came in a range of colors. It was mass produced, low end glassware. During the 1930's, Depression Glass was marketed as affordable glassware and could be purchased at five and dimes. It was also used an incentive by cereal and laundry soap companies which would often include a piece as a gift with purchase. Gas stations and movie theaters also used Depression Glass items as a gift with purchase. One in one thousand pieces of sea glass may be peach or pink. Aqua Sea Glass is my favorite color to find. Also known as aquamarine, it looks like an extension of the sea itself and can evoke a feeling of tranquility. Aqua glass has many subtle variations and shades. Sources of this glass could be from a vintage canning jar or vintage insulator used on electric poles in the early 1900's, Seltzer mineral water bottles, medicine bottles and ink bottles. 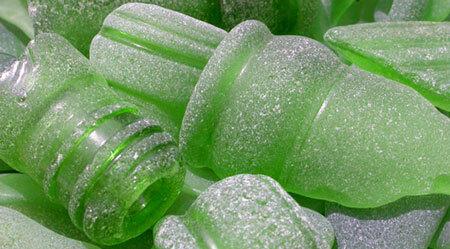 Colorless glass replaced aqua as the color of choice with one exception the greenish aqua of Coca-Cola bottles. One in five hundred pieces of sea glass may be Aqua. I found this piece of aqua multi-colored sea glass at Seaham, England. Cornflower blue glass predates the color cobalt blue. It is much lighter in color. Cornflower blue sea glass most likely comes from Pre-1900 Phillips Milk Of Magnesia bottles, Bromo Seltzer, Vick's Vapor Rub and ink wells. 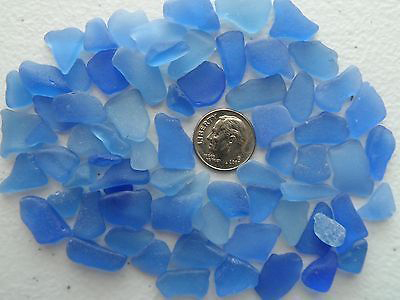 One in five hundred pieces of sea glass may be Cornflower Blue. Cobalt Blue sea glass is vibrant and jewel like. The best known sources for cobalt blue sea glass are vintage Noxzema Jars, Bromo Seltzer, Milk of Magnesia, Vicks Vapor Rub, medicine and poision bottles, castor oil bottles, glass rolling pins, Collyrium soothing eye lotion glass eye wash cups, ink bottles and perfume bottles. 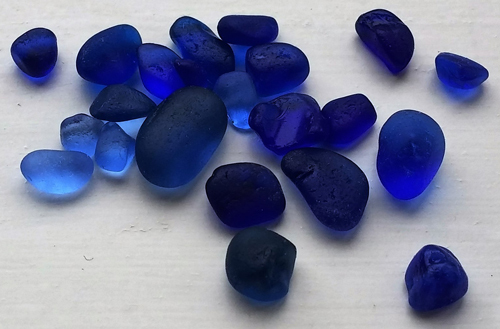 One in two hundred and fifty pieces of sea glass may be Cobalt Blue. I found these gorgeous cobalt blue pieces in one day at Seaham, England! 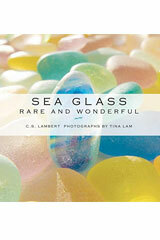 "Recognized expert on sea glass, C.S. Lambert guides readers through her personal collection, revealing the fascinating true stories of each piece’s origin. Lambert shares the story behind the design of vintage bottles, the hidden purpose of mysterious pieces of sea glass, and the history of china patterns and ceramic dolls. She also shares some of the rarest specimens of sea glass, for some of which there are only one or two pieces known to be in existence." Orange sea glass is indeed rare and elusive, it's also a beachcombers dream. 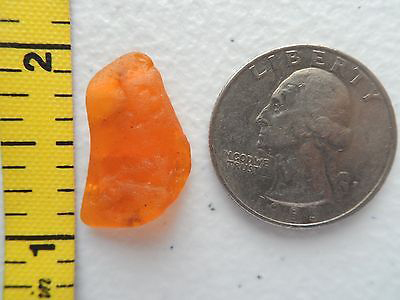 I personally have only found about four tiny pieces of orange sea glass, mostly from my trips to Seaham, England. Orange sea glass most likely originates from auto warning lights, vintage Avon glassware, decorative glass items and art glass. One In ten thousand pieces of sea glass might be orange. Red Sea Glass is one of the most difficult colors of sea glass to find. Anchor Hocking Royal Ruby Red Glassware was popular and made items such as dishes, cups, glasses, bowls, platters and vases were produced from 1938 to 1967 and then again briefly in the 1970's. In the 1950's Schlitz beer asked Anchor Hocking to create a red beer bottle for them and Schlitz Beer was bottled in Anchor Hocking Royal Ruby. Anchor Hocking discovered a way to use copper to turn glass a red hue instead of the traditional gold, making the cost of producing this glass much more affordable. Many vintage Avon products were bottled in red glass such as perfume, dinnerware and decorative household items. Other Sources include car and boat running lights, railroad and ship lanterns along with various other types of household and decorative glass. What a thrill it was to find my first piece of red sea glass. The waves had tumbled it all the way up to the walk path just south of the pier in San Clemente, California. One in five thousand pieces of sea glass may be red. These are all from Seaham, England. 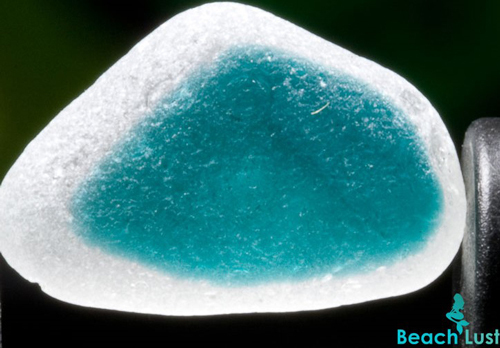 Turquoise sea glass is very rare and coveted. A few of the possible origins for these gorgeous treasures are old electric glass insulators, vintage siphon seltzer water bottles, old decorative glass and Victorian era stained glass window panes. 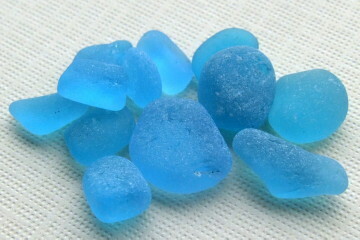 One in five thousand pieces of sea glass may be deep turquoise. 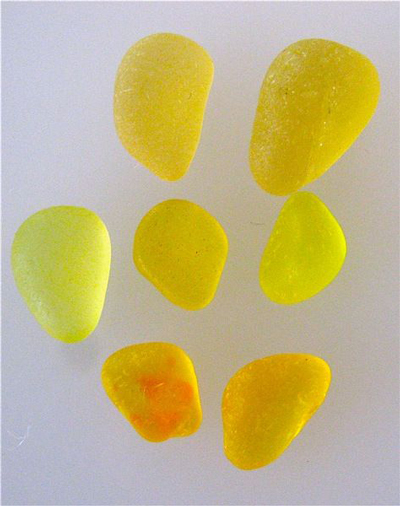 Yellow sea glass or light amber sea glass. Sources for this sea glass are depression glass, art glass, stained glass, old glass insulators and glass that is made with selenium. During World War I The glass industry replaced manganese with selenium. Over a period of many years glass made with manganese turns lavender when exposed to sunlight and glass made with selenium turns a soft yellow-gold when exposed to sunlight. One in thirty five hundred pieces of sea glass might be Yellow. 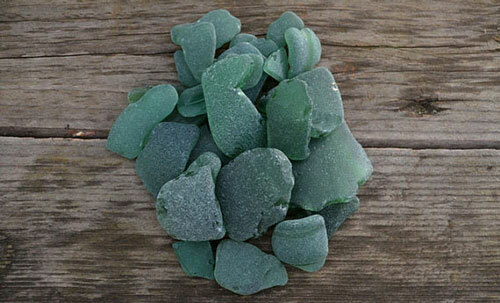 Most gray sea glass shards came from thick pieces of leaded-glass tableware and Depression glass . Another source could be old glass television screens. One in two thousand pieces of sea glass might be gray. Black glass is one of the oldest bottle colors. Black glass is interesting as it actually has a hint of another color such as brown or olive green. During the 1700's most liquor and ale/beer bottles were mass produced as a cheap container between the 1840's and 1880's bottles were made in a deep, dark olive green color. The glass only appears to be black because of the density of the glass. 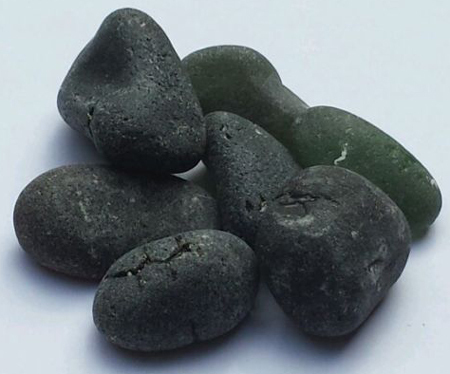 If you find black sea glass it might look like a common rock, Its best to take it home and hold it up to a light. This glass may be from Champagne bottles, Case Gin bottles (this tall bottle is easily identifiable due to its square sides that narrow at the base) dark green wine bottles. One in two thousand pieces of sea glass might be black.